You’ve probably found this page because like me you were looking for some solid information on how the Nissan Juke DCi DPF system works. 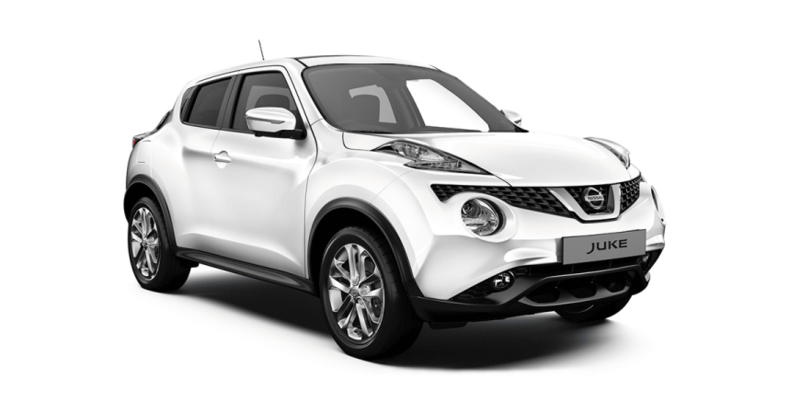 Either Nissan are having a laugh at the our expense or the internet has truly failed us because I am unable to get a copy of UK Juke owners manual. 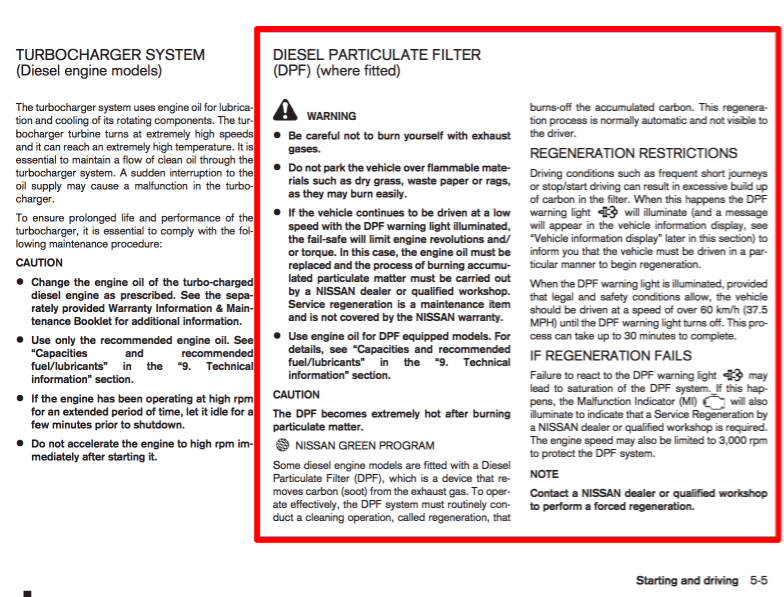 Finding a US manual isn’t an issue but it contains no information on the DPF system at all. The closest thing I could find was a forum post on one of the Juke UK forums. Previous version of the 1.5 DCi engines fitted to the Juke had a DPF light. Like my old Qashqai this would illuminate if the sensor detected the DPF was becoming blocked. This would trigger either a dealer visit or a DPF burn run to burn off the soot. Never version of the Juke featured a system called OCS (oil condition sensing). This system constantly monitors oil condition and is able to tell is the condition of the oil has reduced enough to be a danger to the oil clogging up. These newer versions of the Juke also feature a 5th injector in the exhaust manifold. This injector allows the temperature of the exhaust to increase by a substantial amount and therefore aid a DPF “burn” or regen. This system can have a negative effect on oil quality and therefor its vital that the OCS system is working in partnership with the 5th injector. The above isn’t word for word but you get the idea. What we are struggling with is the facts about how the DPF light is triggered and what is required by the driver to perform a successful DPF regeneration without dealer assistance (and costs). Regeneration restrictions: Driving conditions such as frequent short journeys or stop/start driving can result in excessive build up of carbon in the filter. When this happens the DPF warning light will illuminate (and a message will appear in the vehicle information display, see “Vehicle information display” later in this section) to inform you that the vehicle must be driven in a particular manner to begin regeneration. When the DPF warning light is illuminated, provided that legal and safety conditions allow, the vehicle should be driven at a speed of over 60 km/h (37.5 MPH) until the DPF warning light turns off. This process can take up to 30 minutes to complete. If regeneration fails: Failure to react to the DPF warning light may lead to saturation of the DPF system. 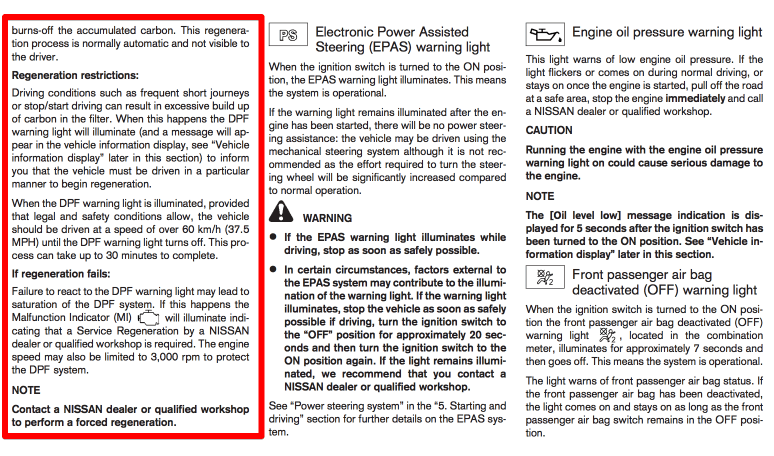 If this happens the Malfunction Indicator (MI) will illuminate indicating that a Service Regeneration by a NISSAN dealer or qualified workshop is required. The engine speed may also be limited to 3,000 rpm to protect the DPF system. NOTE Contact a NISSAN dealer or qualified workshop to perform a forced regeneration. Service regeneration is a maintenance item and is not covered by the NISSAN warranty. 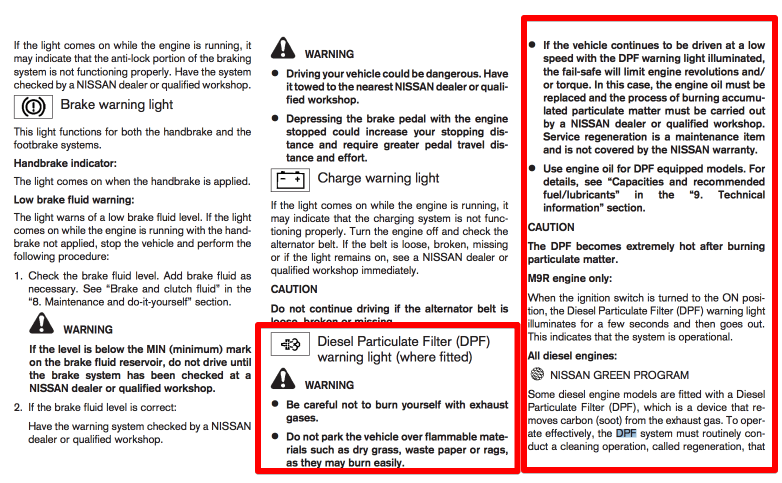 As you will see from the last snapshot from the manual, Nissan is VERY clear that DPFs are NOT covered by the vehicle warranty. We’re simply shocked with the lack of information about the DPF in the Juke. We’ve managed to locate some online manuals from the US but they don’t even mention the word diesel in them – I’m not even sure if the Juke was available with a diesel engine over there. Please let us know! I know you’ve come here for the information we have but we really need your help with this one. Are you UK Juke owner with a service / owners manual? Can you send us some photos of the pages about the DPF? Does it even mention it? We’d like to hear your experiences with your Juke so please leave a comment below, don’t forget to like Google + and also share this page so we can help other Juke owners struggling with their DPFs too. Hi, had an issue with the DPF filter back in Jan 2016, or rather it was suggested i did. I have an early 2014 Juke 1.5DCI had an issue last year whereby the engines management light came on and the car was running spluttery over 40pmh, took it to the dealer and they said it needed a new DPF argued the toss as the car was only 18 months old, they lectured me over the way it was driven and they “replaced the dpf” as a good will gesture. All sorted, Car gets driven in line with the requirements for DPF burn off anyway so no issue there on my part. This weekend the same has happened, same symptoms, RAC called, taken into the dealer, diagnostics point to the DPf and that they will have to do a regen, waiting for the confirmation. HOWEVER, after coming across your post above, it led me to read the handbook, which states that if a DPF is fitted i will be notified of any DPF issue by the DPF light coming on on the dash, at which point i should drive like a loon for 30 minutes to complete a regen, same as your pages above from handbook states. On the previous occasion it happened and this time that its happened no DPF light has come on, the only light i see on the dash is the engine management light and a green auto light that flashes which tells me that auto is deactivated… Nothing to highlight that a regen would have been required at some point………. Thoughts ? Unfortunately the design of the exhaust system in the Juke is not ideal for successful DPF regens. I suspect that your DPF filter is indeed need of a forced regen. I’d be interested to know what the back pressure indicators are as it would show if it’s soot or ash. Ash is not burnt off during and regen and would mean a new filter unit. I too had countless DPF issues with my Qashqai which ultimately let to us parting ways. I would suggest that you seek advice from your dealer as I would expect the DPF light to be on. 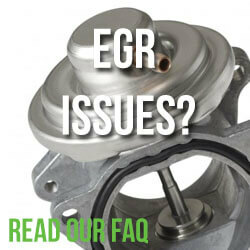 It could well be the EGR valve that’s fault. I suspected this on my QQ too. I’m also a little concerned as to why you would have to wait for confirmation. The engine management system would flag this instantly. Hi Karl, had the call, DPf filter needs a regen, along with oil and filter change required, EGR pipe and sensor need to be replaced and there are problems with the glow plugs, thankfully they are doing it under warranty for me so thats a relief. Im at the end of my contract in 3 months and was considering a QQ, as its the same engine i was looking at I’m not so sure now. Wow thats a lot of works! I’ve very surprised they are covering the cost – esp for the DPF regen. All the diesel Nissan models use the same DPF regeneration systems which have proved to be very unreliable. I’d go with one of their turbo petrol units if it’s not too under powered. I think they do a 1.2 turbo. Hi, Nissan quotes me over £500 for a replacement thermo plunger and DPS regen. They have just called me to say that the DPS unit now needs replacing and this puts the price up to £2300! Nissan Juke just out of Warranty. Wow! That’s a lot of cash. I would push for a dealer contribution to the costs if you can. 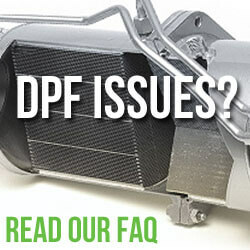 DPF filters are not covered under warranty but you may be able to get some help with the costs. Especially if you’ve looked after the car with regards to servicing etc. I’d also seek quotes from independent specialists who maybe able to source a cheaper alternative and confirm the diagnosis. Nissan duke as I was ordering this car as an NHS lease car. Not one person mentioned it would be insiutable for my job as it dosnt do well with that kind of driving style. The car has been in for engine problems since it was a couple of months old. There has also been great problems with the dpf filter which ment even though the car was least through the NHS I have had to pay for the repairs . The car is taken on the motor way or duel carriage way several times a week but the problem keeps occurring with the dpf light coming on. It never clears no mater how long I drive it on low gears on the motorway and then has to go in for forced regeneration Ann’s I have to pay again for the work. Why has this car been allowed on the NHS lease list. Why has it not got a warning light indicating the car needs to regenerate. Most of the garages will inform me that my colleagues and disabled people are having the same problem. I think Nissan or Arnold Clark are making a fortune out of these problems and are not concerned in any way about their customers. Would never drive one of these cats again it’s been a pig in a poke. Arnold Clark should be taken to court for this it’s daylight robbery. My 2014 Juke has had the same problems Nissan Hylton Worcester had it in for 2 days recently when the MOT was done, 1st day 18/6/17 had a courtesy car but DPF hadn’t been sorted. Took the car away having been told that ideally it should have been booked in for two days. Re -booked 2nd day 23/6/17 no courtesy car available, took a flexi day off work. I picked the car up Sat 24th still not sorted so far no charges involved. Hylton then got back to me 26/6/17 to tell me that its not covered under the cared 4 warranty that runs out at the end of this Month. Re -booked in for 27/7/17 for another two days when a courtesy car is available. I have been informed it they will have to drop the exhaust down etc,however now getting worried after seeing what other people have been charged for DPF problems. The really annoying thing so far is that no one was willing to tell me that it was not covered under the cared 4 policy until 26/6/17. I don’t think that the local dealer can be blamed for what obviously seems to be a complete design fault. Nissan UK should own up and do something about it. My journeys are mostly motorway so hardly any start stop driving, the so called wrong way.Having read your forum it seems that some of the contributors have had the problem sorted under good will,again it should not be left to the local dealer to make this decision. Nissan UK obviously should be responsible for this. Because of the on going problem they realise that it keeps coming back. It would be interesting to know if newer models have had a design alteration? If this had been a safety issue they would have had to cover the fault by way of a recall to fix it costing them millions,easier and cheaper to fob us off. Earlier this month i have been contacted asking if i wish to extend my care 4 policy for another year at around £227,what a laugh!!! My 2013 Nissan Juke has been a nightmare. The engine management light came on (stating soot accumulation) advised regen paid the garage, light still on. Took back was advised new glow plugs needed paid the garage light still on. Took back advised needed another regen as previous was before glow plugs fitted paid the garage engine light still on!!! I have since spoken with a company who specialises in dpf’s. I was advised to do a forced regen myself to do this drive in gear 3 minimum 2500 revs (not over 3000) for 35-40 mins. I have done this and 3 days later the engine management light is still off! Fingers crossed this is the end of the issue…but I’m not too hopeful.